How Much Does Floor Heating Cost in Seattle? Seattle is the largest city in both the State of Washington and the Pacific Northwest region of North America and is one of the fastest-growing major cities in the United States according to Wikipedia.org. Located between the saltwater Puget Sound (an arm of the Pacific Ocean) to the west and Lake Washington to the east, Seattle may be best known for its landmark Space Needle and for its rainy climate. 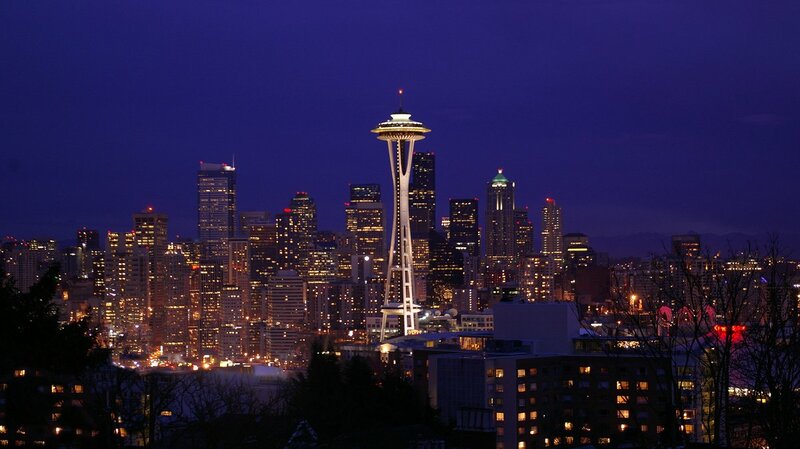 Seattle's climate is usually described as oceanic or temperate marine, with cool, wet winters. And even though the winter season brings temperatures on average of 42 degrees Fahrenheit based on CurrentResults.com it’s the damp cold that makes radiant floor heating a perfect solution to warm up that cold tile or stone flooring. According to Zillow.com, it’s a red hot seller’s market in Seattle. Furthermore, statistics show that homebuyers typically undertake remodeling projects upon moving in, and radiant heating ranks top among those home improvements. WarmlyYours has an electric floor heating system for almost any application for any room in your home. Let's take a look at some specific examples. In this case, adding radiant electric heat to a mid-size Seattle bathroom was very affordable and a great way for the new homeowner to bring additional warmth and comfort to their morning routine. 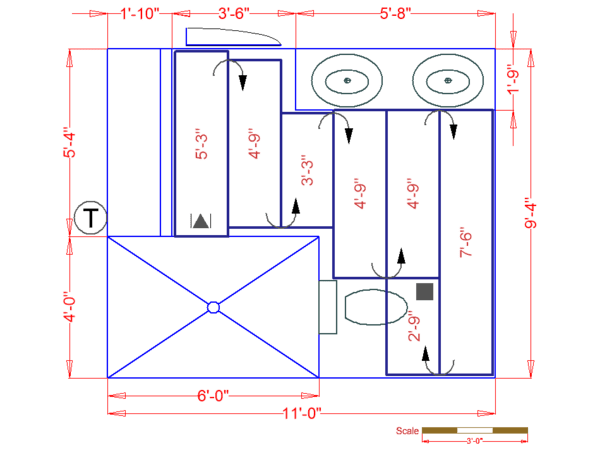 This Seattle homeowner installed a 1.5- by 33-foot TempZone™ Flex Roll in their 79-square-foot bathroom for $544.50 at a cost of just $10.89 per square foot (see floor plan). And with 15 watts per square foot of radiant heat (the highest allowed by the National Electric Code), it can be a primary heat source for this bathroom. In addition to the low cost of the materials, the operating cost should also be factored into the project. 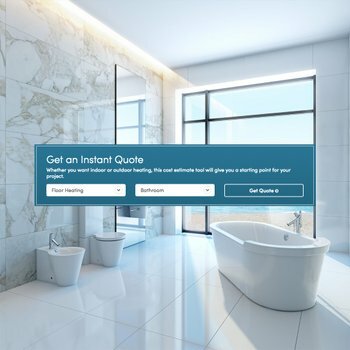 It only costs 12 cents per day to heat this bathroom for four hours a day, WarmlyYours’s underfloor heating Operating Cost Calculator. And beyond that, it only costs $18.89 to heat the bathroom during January, the coldest month of the year, based on the radiant Heat Loss Calculator. Best of all, the annual operating cost for the radiant heated floor is $109.10 — a small price to pay for the comfort and luxury of a warm bathroom. When upgrading their kitchen, these homeowners thought it made sense to include underfloor heating in the remodeling project to bring their home up to date and appeal to potential homebuyers. Now not only will they be able to showcase their home with the newly remodeled kitchen, but a kitchen with a warm floor should help seal the deal. Now that you know the low cost of the materials, the operating cost should also be considered when planning your project. 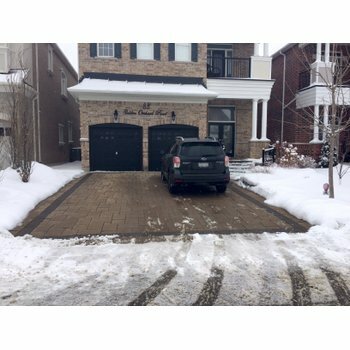 According to the WarmlyYours’s underfloor heating Operating Cost Calculator, which factors in the average kWh cost, it only costs about 12 cents an hour to heat this kitchen for eight hours every day, a small price to pay for the additional luxury it brings to one of the most used rooms in the home. Operating the floor heating is very affordable. According to the underfloor heating Operating Cost Calculator, it only costs 37 cents a day to heat this bedroom for eight hours. Based on WarmlyYours’s radiant Heat Loss Calculator the highest the monthly electric bill for this room would reach is $16.73 during the coldest month of the year. 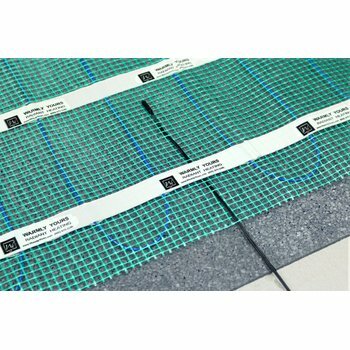 Operating the underfloor heating is also inexpensive. Based on results from the radiant heating Operating Cost Calculator, it only costs 73 cents a day to heat this living room for eight hours. Annually, that comes out to just $30.55, per the WarmlyYours’s radiant Heat Loss Calculator. In this instance, these homeowner’s decided to install radiant heating during a recent remodeling of their home office to take the chill off their wood flooring. The system was designed to heat the floors of their office using Environ Flex Rolls at a cost of $900.00. That amounts to just $9.21 per square foot. (Refer to floor plan below). When budgeting for your project it’s important to consider the operating cost of your floor heating system. WarmlyYours makes it easy for you with our in-floor heating Operating Cost Calculator. Based on the data from this tool, the cost to operate this system for 8 hours a day is just 75 cents. This calculator factors in the average kWh cost, which is just over 16 cents. In fact, the annual operating cost is just under $14.00 according to our radiant Heat Loss Calculator. Can Radiant Heating be a Primary Heat Source? Floor Heating systems can be an effective primary heat source. Though the effectiveness of any heating system can vary given such variables as climate, insulation and the position of the room that you want to heat in your home. It’s important to figure out the exact heat loss of a room prior to installing underfloor heating to guarantee that the heating system can provide enough heat to make the room comfortable. If too much heat escapes from your home, floor-heating would be a better supplementary heating option instead of a primary heating source. A few things play roles in exactly how much heat your room loses. First, if your room includes any exterior doors and/or windows, it is susceptible to heat loss. A Washington Post article reports that air leaks coming from gaps around doors and windows are responsible for as much as 21 percent of your home’s heat loss. How much heat is able to escape determines to what extent your room can be sealed. Another significant cause of heat loss is a fireplace. Air often escapes out of the chimney, even if the damper is closed. In fact, approximately 14 percent of your home’s heat loss comes from fireplaces. To help you get the heat loss report for any room in your home, our radiant Heat Loss Calculator will ask how well your room is sealed, how many fireplaces it has, etc. to see how much heat is being lost. For example, take a 150-square-foot room located in the Midwest with an average sealing factor. The room is located above a heated room and the ceilings in the room are 9 feet. According to WarmlyYours’s radiant Heat Loss Calculator, a floor-heating system can be the primary heat source for this room. It also notes that it would cost about $75.00 to operate the system during the coldest month of the year. To see if radiant heat can be your room’s primary heat source, check out WarmlyYours’s radiant Heat Loss Calculator for yourself. Next Post How Much Does Radiant Heating Cost in a New York Kitchen?